Exclusive £5 Gift Card with Orders Over £60 at Liverpool Football Club Spend over £60 through this link and simply wait for your purchase to be verified. We'll then email with how to redeem your £5 gift card! Free £10 Voucher with New Home Kit Pre-orders at Liverpool Football Club - Launching 8th May! Home Kit from £10 at Liverpool Football Club - Personalisation Available! Support your team with the home kit! Check out the range from £10 at Liverpool Football Club. Find £10 And More Off in the Clearance at Liverpool Football Club Shop the clearance and discover savings on Liverpool Football Club clothing and merchandise! 20% Off New Balance at Liverpool Football Club Shop the New Balance sale and find 20% off at Liverpool Football Club. Away Kit from £10 at Liverpool Football Club Get kitted out for those away games from just £10! Third Kit from £12 at Liverpool Football Club Prove your loyalty to the team with the third kit, available from £12 at Liverpool Football Club. 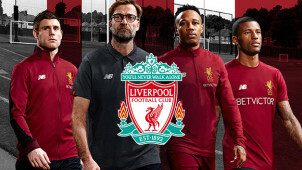 50% And More Off Clothing and Accessories in the Clearance at Liverpool Football Club Grab t-shirts, pyjamas, jackets and more with 50% or more off in the Liverpool Football Club clearance. Men's Trousers and Shorts from £25 at Liverpool Football Club Get some official Liverpool shorts and trousers from just £25 at Liverpool Football Club. Souvenirs from £1 at Liverpool Football Club - Cups, Keyrings, Pictures and More Check out the great selection of souvenirs available online at Liverpool Football Club! Add some to your collection today. Women's Jackets from £35 at Liverpool Football Club Support your team in style with jackets from £35! Perfect for those cold days in the crowd. Men's Polo Shirts from £22 at Liverpool Football Club Wear it loud and proud with polo shirts from £22! Baby Collection from £5 at Liverpool Football Club Get them dressed up in some adorable Liverpool Football Club official clothing from just £5. Men's Watches and Accessories from £20 at Liverpool Football Club Get some Liverpool football accessories into your life from just £20! Home Furnishings from £3.50 at Liverpool Football Club Jazz up your home with some Liverpool Football Club furnishings and show everyone what a true fan you are. Kids' Tracksuits and Joggers from £15 at Liverpool Football Club Get them a gift they'll love - Liverpool official tracksuits! Head over now for deals from £15. Liverpool FC online store is the first place to go to for exclusive genuine Liverpool FC merchandise, stocking thousands of Liverpool FC products with new lines each week. Get your mitts on the latest football kits, clothes, accessories and souvenirs you could possibly think of and beyond - sunglasses, hats, pyjamas, slippers, retro ‘track’ jackets, polo shirts, socks, boxers, bags, scarves, mugs, sweets, magnets, flags, teddies, watches, jewellery and more. There is a whole section designated to signed goods, which you know are the real deal from this site only. You can buy signed photos, programmes, shirts, balls, gloves and boots to make the ideal gift for a Liverpool fan or visit the personalised section where you can buy Liverpool FC mugs, bottles, pens and tees with your last name stamped on it. And if you are looking for tickets to Anfield Stadium then you can reach the official main website here, and put all your merchandise purchases to good use by getting to the next Liverpool game. How do I use my Liverpool FC discount code? Click on your chosen items and add to basket and then check out. Then press ‘Continue to Secure Checkout’ to complete your payment process. Register with Liverpool FC for free and be the first to know about exclusive promotional merchandise offers and prize competitions. Can I track my Liverpool FC order? Yes you can. There will be instructions about how to do this via the courier site in your confirmation email once your order has been dispatched. What payment methods do Liverpool FC accept? You can pay via most card types - please see here for more details. Where is my local Liverpool FC store? You can find your local store via the website here. You can return your Liverpool FC merchandise within 14 days and get a full refund. Please see details further details here. Are you a true Liverpool football fan? Are you kitted out with all the fanfare for Liverpool Football Club’s next big game? Make sure you look the part with your next ticket to Anfield stadium by using vouchercloud’s Liverpool FC discount code to get that camera rolling towards you. Take to the pitch in your very own Liverpool FC football kit, keep warm on the sidelines in a Liverpool FC hoody or get on prime-time TV by rocking up to the next league match in a Liverpool FC onesie. If you have been to a particular game or watched a memorable match on the TV, you can make sure some of that team spirit rubs off on you by bidding for a ‘match-worn’ t-shirt through the site. Get your hands on a favourite team players t-shirt and wear your heroes victorious tee with all the pride and glory it deserves. Go to the Auction part of the website and get bidding - time is ticking. Check out the full range of Liverpool Football Club's home kits for men, women and kids complete with the t-shirt, shorts and socks - red, red and red! With your Liverpool FC voucher code you could kit out the whole family for the next big game and practice your ‘You’ll never walk alone’ song in true brilliance. If you want to go a step further you can even order a personalised t-shirt with your name on it!